Jack Schmitt exits Apollo 17, helped by a Navy swimmer. flotation collar around the spacecraft that would both stabilise it and provide a platform for the exiting crewmen. They also recovered the detached parachutes if possible. 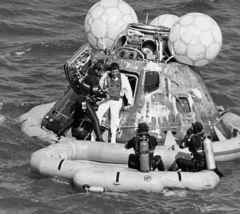 The fifth helicopter carried a 'Billy Pugh' rescue basket with which it would pluck the three crewmen, one by one, off a life raft next to the spacecraft and into the helicopter to be taken to the ship. 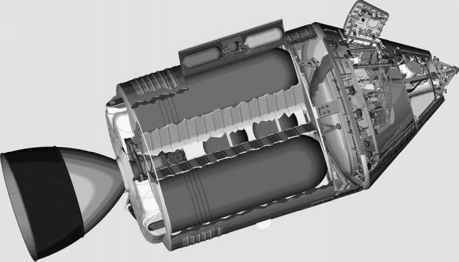 Inside the spacecraft, the crew charged a gas-powered counterbalance for the main hatch in preparation for opening. After the Apollo 1 fire, the two-piece inward-opening hatch of the Block-I spacecraft was replaced with a single unified hatch that could quickly be opened outwards. A problem with this arrangement was that while sitting upright on Earth, the heavy door had to move against gravity so an ingenious counterbalance arrangement was added that was powered by compressed air bottles.